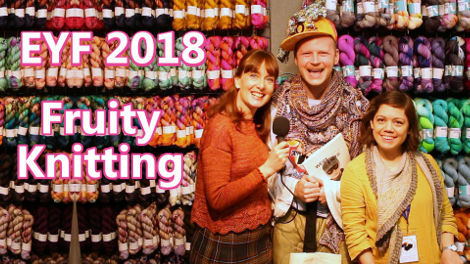 Edinburgh Yarn Festival 2018 coincides with Episode 50 of the Fruity Knitting Podcast. In this Episode while we’re celebrating we would like to share some of the personalities and some of the atmosphere of the Festival with those who couldn’t be there. If you were fortunate enough to attend, then maybe we can firm up some fond memories. 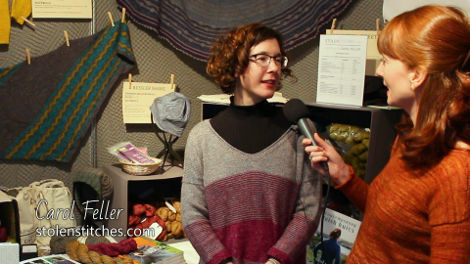 We have short interviews with a colorful selection of 12 vendors from the Edinburgh Yarn Festival, covering designers, yarn producers, dyers and suppliers of tools and accessories for the knitter. 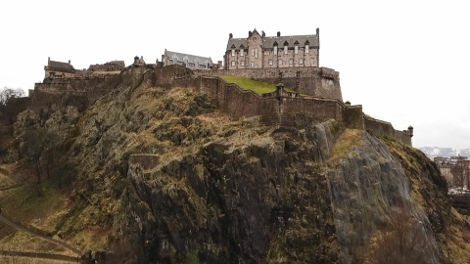 Edinburgh is a beautiful city and well worthy of a visit in itself, and we take you on a tour showing you our highlights. We will also get you in on some of the social events around the Festival. 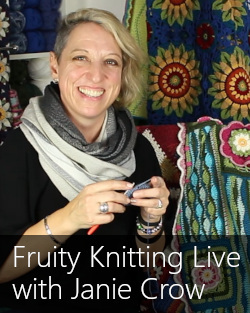 And finally, as it is a yarn festival, Andrea will give you a quick look at the knitting projects that she has planned and the yarns that she bought in Edinburgh for those projects. 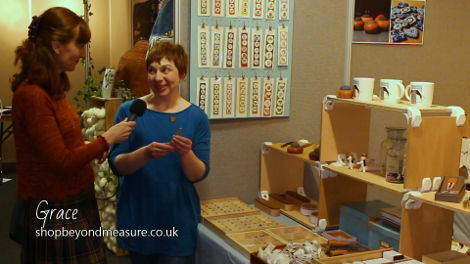 We had a brilliant time at the Edinburgh Yarn Festival, and we hope we can share some of the fun with you. 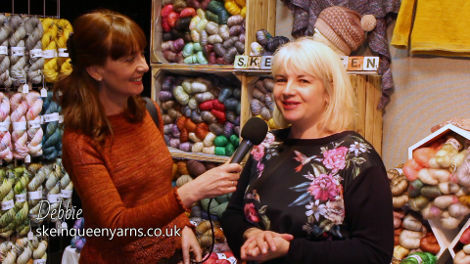 The Edinburgh Yarn Festival is the creation of Jo and Mica, two passionate knitters who organised the first Festival in 2013 in response to their own need, and have since taken the event from strength to strength. The Festival is now held in the Edinburgh Corn Exchange, a beautiful building which now serves as a venue for concerts, conferences and other events. There is a market hall with a good variety of well-chosen vendors, but there is also plenty of space for sitting, knitting, planning purchases and chatting over a good soup or a scone and tea. Seating space was extended this year to include a marquis right off the main building. This was also the venue of the Knit Night and the Ceilidh – a traditional Scottish dance evening. Catering is good quality and reasonably priced, making it easy to spend a good day (or more) at the event. It is clear that organizers Jo and Mica know the needs of the knitter. For the last few years there has also been a “Podcaster Lounge”, organised by Louise from the Knit British podcast and sponsored by Blacker Yarns, which provides a center for viewers and listeners to come and meet their favorite podcasters – and for podcasters to meet up and exchange experiences. Thank you to everyone who did come and say hello. We feel privileged that you choose to make us some little part of your lives, and we love to hear your stories. 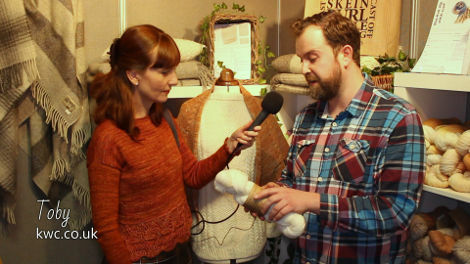 Ange and Rob Sewell from Weft Blown produce “weather-inspired” textiles, and also do classes and supply equipment for spinning and weaving. They are located in West Kilbride, on Scotland’s beautiful Ayrshire Coast. Ange has a background in meteorology and geology, and her creations are inspired by her surroundings and the spectacular skies of the region. I can imagine a nice weekend with a few classes. We featured Cathrin Walk from Walk Collection in Episode 49 as one of the hand-dyers who worked with Veera Välimäki on the recent Interpretations Vol 5 collection. Cathrin was wearing a Stephen West design in her own yarn. Uist Wool is a spinning mill on the island of Grimsay in the Outer Hebrides. The mill was constructed in 2013 and uses a collection of heritage machinery which dates back to the mid 19th century. The company was set up as a social enterprise to support communities within the Outer Hebrides by providing a market for locally produced fleeces. Breeds used include Cheviot, Texel, Blackface, Suffolk, Hebridean plus smaller flocks of Lleyn, Zwartbles and Shetland. Careful grading is done to identify fleeces suitable for spinning into knitting yarns. Carol Feller is best known as a designer, but has recently brought out her own yarn, Nua, which combines merino with the silkiness of yak and the strength of linen. The yarn is available in a sport weight, which Carol recommends as a perfect weight for a light sweater. 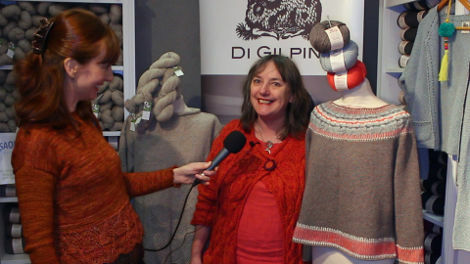 Debbie Orr established Skein Queen in 2007. Debbie has done a lot of one-off yarns – I could get back to 2014 in her archives. 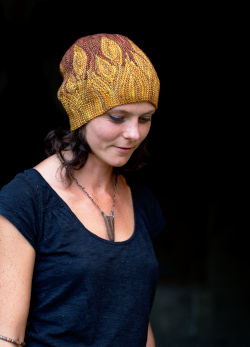 Her yarns have stood the test of time, and Debbie has recently moved into a new studio and expanded her range to include standard colorways. This makes the yarns easier to stock for retailers, and more attractive for larger projects. Prado de Lana is a sheep farm specializing in wool products from Romney, Lincoln Longwool, and CVM/Romeldale sheep, located in Vermont and run by Amanda and Alberto Barcenas. All of the sheep are long wool breeds, and the sheep are coated to ensure that fleeces are clean. Yarns are available in a range of weights and natural colors. La Bien Aimée is a Paris-based hand-dyer but also a shop selling La Bien Aimée and also other luxury yarn brands. Knockando Woolmill is located in the Spey Valley in the North East of Scotland, and has been producing wool and woven products for around 230 years. Yarns are available in natural colors or hand-dyed using plant-based dyes. Some of the machinery used dates back to 1870, but there are also more modern machines. Tours of the mill are available, but check with the mill before planning your visit. In addition to spinning yarns for other producers, John Arbon has several of his own ranges, the best-known being the Knit By Numbers ranges. Knit By Numbers comes in DK and 4-ply weights in 103 colors, the 4-ply now coming in mini-skeins, ideal for colorwork. Andrew was wearing the Ashie by Lisa Richardson. 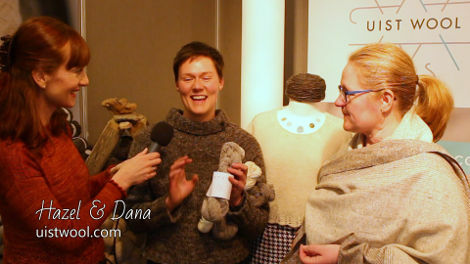 Andrea covered some of the technical challenges of this sweater in Episode 2. Andrea was wearing the Manzanita Tee. You can hear about this garment in Episode 37, and meet the designer Romi Hill in Episode 32. 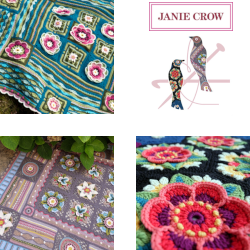 Upcoming Projects – and EYF 2018 Yarn Purchases! Thank you for a beautiful podcast. I was at Edinburgh about 15 years ago-loved seeing it all again. I have a question about something I saw in your podcast. About minute 7:47 you are showing a booth with a beautiful jacket/cardigan. It is lacy and done in a soft pink color. There is a gray beaded scarf at the top of the manikin. I can see the tags of the yarn vendor with a big Y, but I can’t make out the name. Can you tell me the name of the vendor? I am hoping to find out about the pattern for that jacket. Hi Ellen. I think you’re talking about Paloma, which is available from Yarntelier. Cheers, A + A.
I was exhausted just watching! I enjoyed the interviews, which I thought were a great balance of names I knew and ones I didn’t. Also got to hear the names of other podcasters I haven’t yet watched or listened to, and will now check out…Great work as usual, Andrew and Andrea! Andrea and Andrew, I think you did an amazing job with this EYF podcast! I hope one day to attend in person, but certainly felt as though I had an excellent taste for what being there and in Edinburgh itself was like. You gave a nice sampling of the many wool brands and other goodies available too. Please know that your time and attention to detail are much appreciated.Thank you. Hi Sue. It’s the Lammermuir Wool Lace Weight. Cheers, A.
Dearest Andrea and Andrew, thank you so much for this wonderful immersion into the festival and congratulations for your 50th episode. 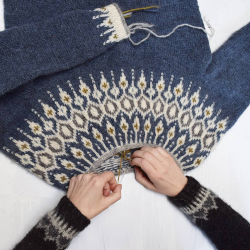 At minute 8:43 there is a beautiful cardigan with with a celtic cable pattern along the yoke and front, next to the dark tonal yarns, that caught my eye. Do you know by chance the name of the pattern or who the designer is? Thank you! Hi Eva. I know the cardigan that you mean – it caught my eye too. I can’t say whose it is off hand, but I am sure we’ll be able to track it down in time, and then I’ll try to get back here. Cheers, A + A.
Oh what a fun podcast to watch! Thank you Andrea for all the interviews and Andrew for all the work filming everything! I think that Kaylee dancing was so cute to see everyone having such fun and so many smiles and laughs! So glad you got to go this year and really appreciate you both and what you do! Hi Amanda. I can’t give you a good answer here. There were around 100 vendors at the Festival, and this introduction includes some quick footage that we did to get a general feel for the show – didn’t take in all the details of the individual displays. I believe the second garment that you are asking about is from Yarnatelier. You could try going through their patterns on their website. For the shawl I really can’t say. 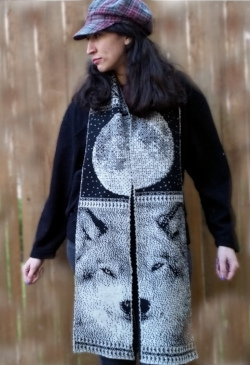 I am guessing that there is a spot on Ravelry where you could post a picture and someone would soon tell you the name of the pattern. Sorry we can’t help any more than that, but good luck in your search! Congratulations on 50th episode.Watched and enjoyed them all! Could you pls tell me the name of the Brooklyn tweed sweater that Andewa was planning to knit? Hi Mariola, It was the Geiger cardigan by Norah Gaughan. Cheers, A + A.
Hi I think maybe you did not see my comment with question from 3/29? Yay! Andrew that was it! 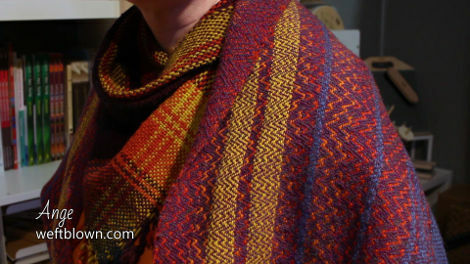 a gorgeous light poncho/wrap called Zephine! Its just what I have been wanting to knit, thanks so much! Glad that worked out, Amanda! Is there a way to download a podcast to my iPad? I became a patron expecting to do this. However it appears the only way to view the podcast is on YouTube. To download from YouTube I have to pay an additional $13 a month. Hi Linda. Unfortunately that is normally not possible with YouTube. We have looked at having the Episodes hosted on another platform but it is far too expensive. I am sorry that we cannot help you there. Kind regards, Andrew. Hi Guys, thank you for another wonderful episode: so much inspiration! can you tell me the name of the orange sweater that Andrea is wearing for most of the interviews, please? It does not seem to be the Manzanita Tee that you have listed. 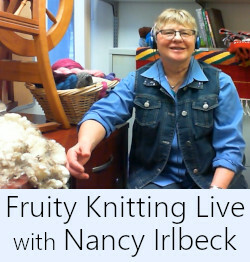 The Manzanita Tee has a lacy yoke, but the sweater Andrea is wearing appears to have a decorative hem, and I love it! many thanks.